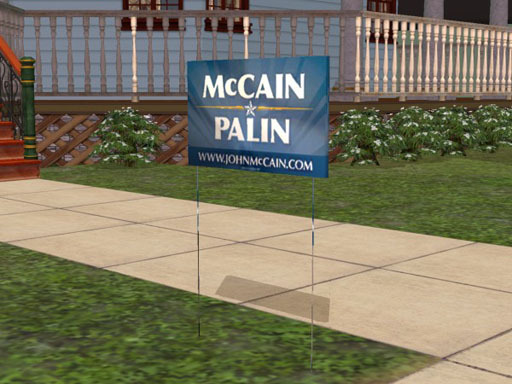 Please note: This is an item that little electronic people in the computer game, The Sims 2, can put in their front yards. If you are looking for things that can be displayed by real people, please go to the John McCain site and follow the link to "Store." Again: This is an object for the computer game, The Sims 2. If you want the real thing, go to the campaign web site. September 13, 2008: If you downloaded this before, get it again. This version should be recolorable. Now for some more fun. Here are four variations on a theme. 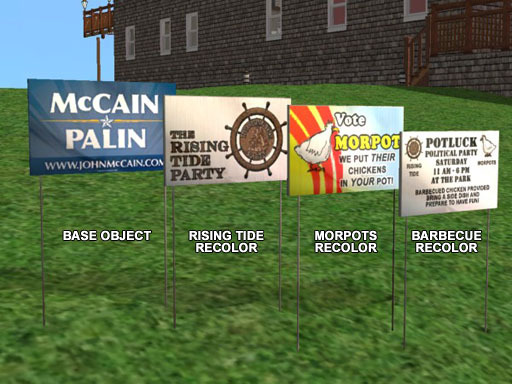 These are all recolors; you must have the base McCain Palin sign installed for the recolors to work. You must have the mccain_palin_base object for the recolors to work. If you downloaded it before September 13, 2008, get the updated version. If you haven't been following any of my stories, you might want to know that basic philosophy of the Rising Tide Party is to take care of problems privately so that no government entity gets a chance to levy taxes to do things. Their motto is, "A rising tide raises all ships." The Morport Party is the antithesis of the Tide. They believe that the government is better able to make decisions about people's lives than individuals and that raising taxes is a virtue. Their motto is, "You get more in YOUR pot with the Morports!" Now, in Happy Valley where there are no taxes at all, they have to draw straws or draft somebody to run on the Morpot ticket since there's just no chance a Morport will get elected. They don't like the idea of having any candidate run unopposed, though, because that would spoil all the fun of having political rallies and barbecues. As a consequence, they are always seeking creative new ways to get someone to take a turn on the Morpot ticket. Often as not, someone ends up on the ticket because of a foolish bet. With that situation, it's not surprising that their idea of a political party is a big barbecue at the park! Fine print:This is not a political site. Normally I don't allow politics on my Sims sites and ask people not to even mention any politicians that haven't been dead for at least 100 years, but obviously I made an exception in this case. Nevertheless, this is neither license nor invitation for anyone to attempt political hate-mongering on my sites. As always, any posts or other behavior that are not in concert with our site's policies will be deleted without comment, explanation, or remorse. Copyright ©2008 by Sun Sims, for the contributors. There are lots of neat things you can do with this sign so unless you are distributing hate material, you are welcome to make recolors if you link back to this topic for the base object. Last edited by Greg : 10-04-2008 at 04:52 PM. Reason: Replacing with recolorable, lower polygon count version. Yay!!!! Hooray!!!! Thank you Greg!! Thank you Raz!! It's great! Thank you, Greg and Razamataz! You're welcome, Crystal and Coco! I'm glad you like it! That's pretty cool! I can think of lots of non-political things to do with that! Want me to poke around and see if I can find out how to make meshes recolorable? It might be pretty simple; BeosBoxBoy recommends a tutorial by Ms. Barrows. Yeah, I know there's a way to do it. It might even be that the thing is recolorable and I'm not doing it right. I should have at least been able to clone it, but I must have done that wrong, too, because my attempted clone didn't show up in the game. Amusement: There's a reason I put that note about how these are things for the game at the top. Several times in the past, I have received notes from folks asking how to buy things they saw in our catalog, referring to items that were made for The Sims 2. These signs and the hats and shirts seemed like things that were very likely to show up in a web search when someone is looking for real-world stuff, so I thought we might save people some disappointment. My favorite story was when a US ambassador to another country, who happened to be from Texas, wrote to ask where she could buy a Texas-shaped rug that was on one of the old SimsHost sites. She was so enthusiastic about it, it broke my heart to have to tell her that it was just an item for a game. But hey, if someone is feeling entrepreneurial, consider making rugs with the outline of distinctively shaped states! There's a market out there! Thanks CocoCrystals you Ladys are so Nice! I'm musing over how much fun we're having while making things that would entice sims to support the candidates. But... little electronic people don't vote! Upload the New one Greg... Its now recolorable! I think Greg is offline right now because like he said never argue with the weather!! Hope he weathers the storm well! Thanks, Raz! Yup, my family and I are safe from the storm's immediate effects. I don't yet have any information on whether either the house I was renting or the house I wanted to buy came through OK.
Folks who downloaded this sign might want to download the new version from this message and allow it to overwrite the previous version. This version (September 13, 2008) is recolorable. The long-awaited recolors are here, including the debut of the Morport Chicken! I think the Morpot chicken is cute tho she looks sad. Thanks, Crystal! I had fun drawing that little chicken. I used a cartoon as a reference; I think it was a Far Side cartoon. I was trying to think of what the Morpots would use for their livery and their slogan, and the chicken seemed to be the most appropriate. I also made an effort to make the pitch convincing and appealing to their constituency. Hooray! A chicken barbecue! We need to get Miner to do the cooking! Maybe we should have added the party balloons scripts to that one! That would be fun!! You could have a barbecue and invite all your neighbors!! Except I wouldn't want that script on every sign so it needs to be a different object.